This document outlines the procedure for granting access to the API Directory in Dev/QA/Production application developers. 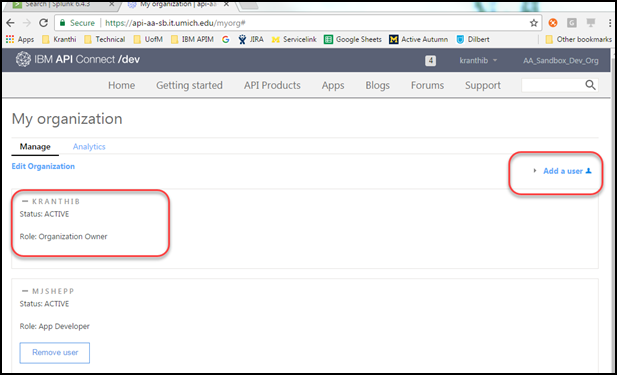 In the new API Directory, the access to the API directory is delegated to the owner of the developer organization. A developer organization is a group of application developers who belong to the same team/department. All the developers within the same developer organizations can see/use all the applications created by other members of the same group. This features helps us to not depend on a single person for creating the applications and maintaining them. The individual granting access must be the owner of the developer organization. Log in to the API Directory Dev/QA/Prod using your UMICH credentials. Click on the uniqname and select My Organization. Note If your Role is shown as the Organization owner, you are able to perform the following steps. Click Add a user on the right side of the page. Enter the umich.edu email of the individual. Click the App Developer radio button to select the Role. Note The user will receive two emails. Please instruct the user to use the second email with the lengthy link to activate his account. We recommend using the Firefox browser when using these links. Please contact API Directory Support if you have any issues.